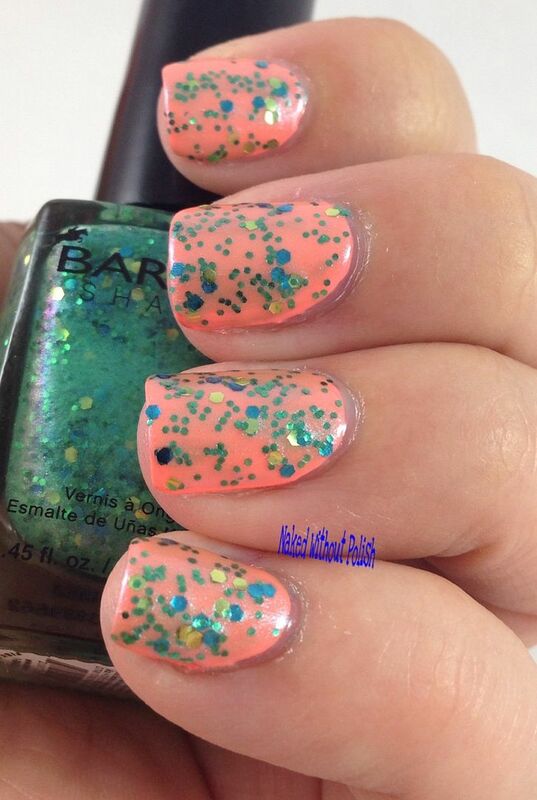 Sea Urchin is described as "a sea foam green glitter". 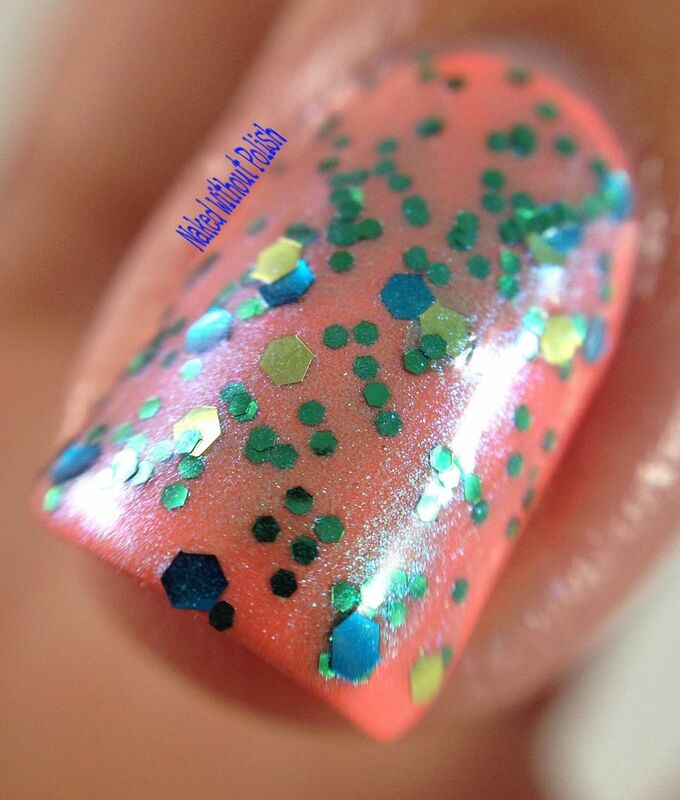 Shown is one dabbed coat of Sea Urchin over Fresh Paints Guava. 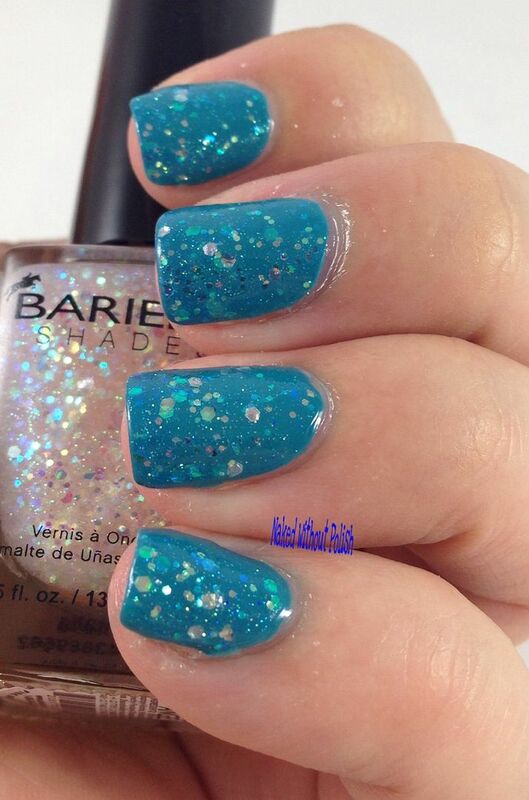 Sea foam green glitter is too vague a description. 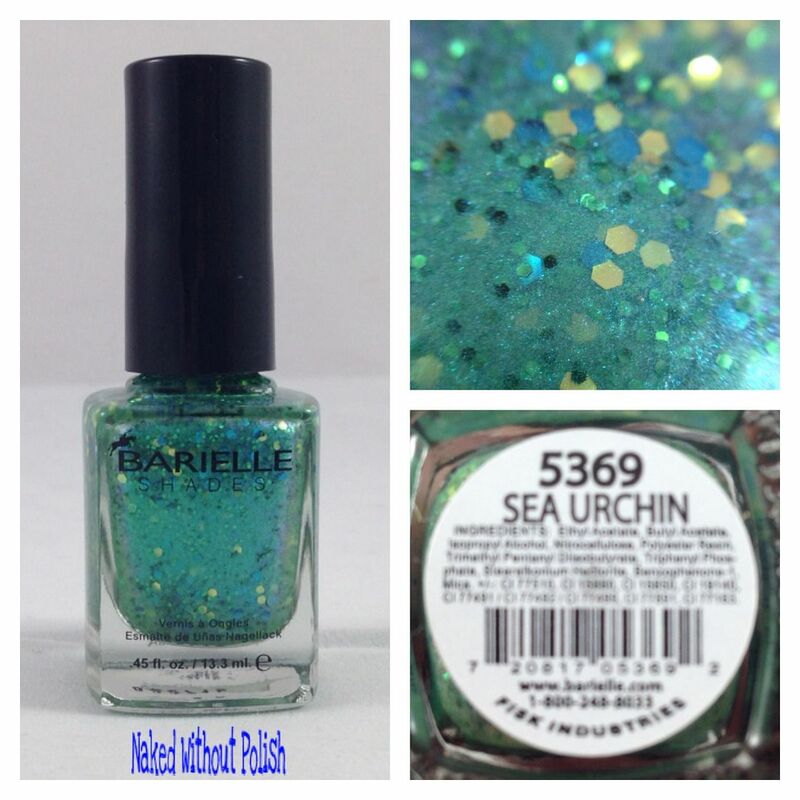 Sea Urchin is a blue green iridescent shimmer base filled with metallic hexes in kelly green, lime green, and teal blue. I thought the orange and green would be a fun combination, but this was a fail pairing on my part (rarely happens). The risk didn't pay off this time. However, I really liked how it ended up looking. It was REALLY thick and hard to work with when I got it. I had to add a lot of thinner to it to get it to work. Amethyst is described as "a purple glitter". 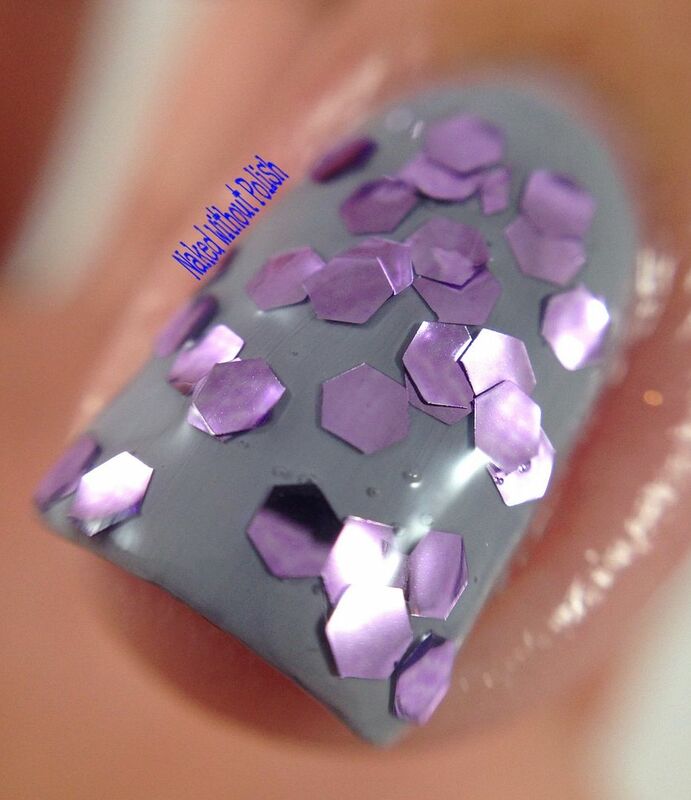 Shown is one dabbed coat of Amethyst over OPI Cement the Deal. 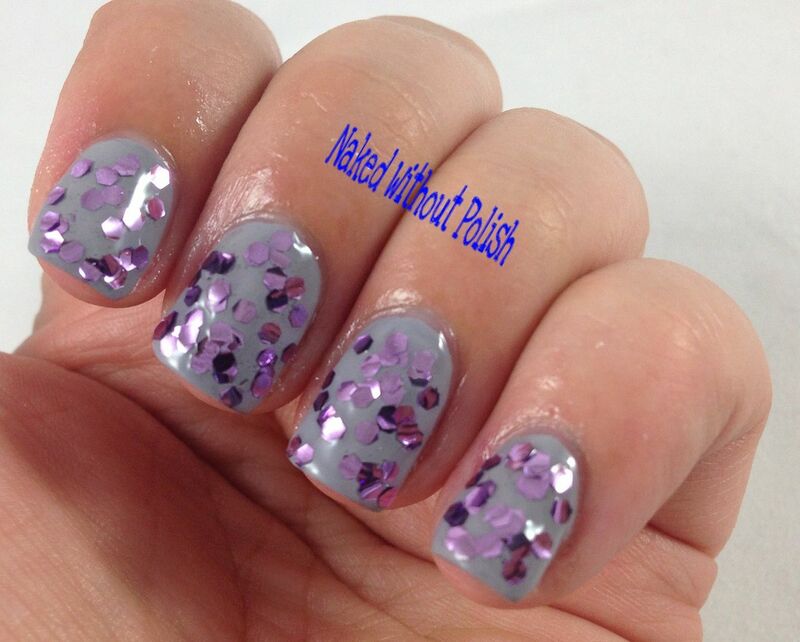 A simple clear base with large purple metallic hexes, Amethyst was surprising. I thought it was going to be boring when I looked at it in the bottle. Then, I pulled the brush out and it was covered in glitter. I was fully expecting to have to fish for glitter with a toothpick. Not the case. However, it was thick and needed thinner. 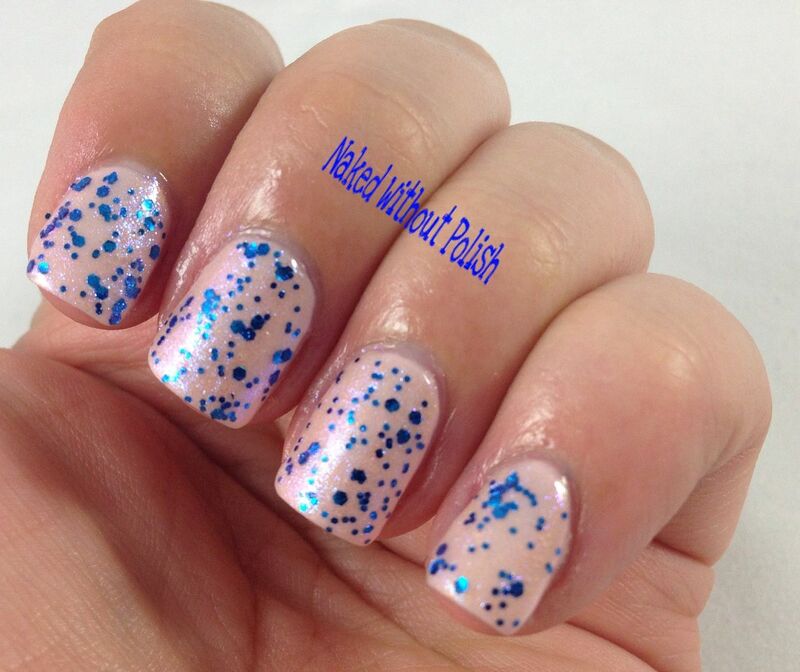 Because it is so simple, you could easily layer it with other fun glitters. 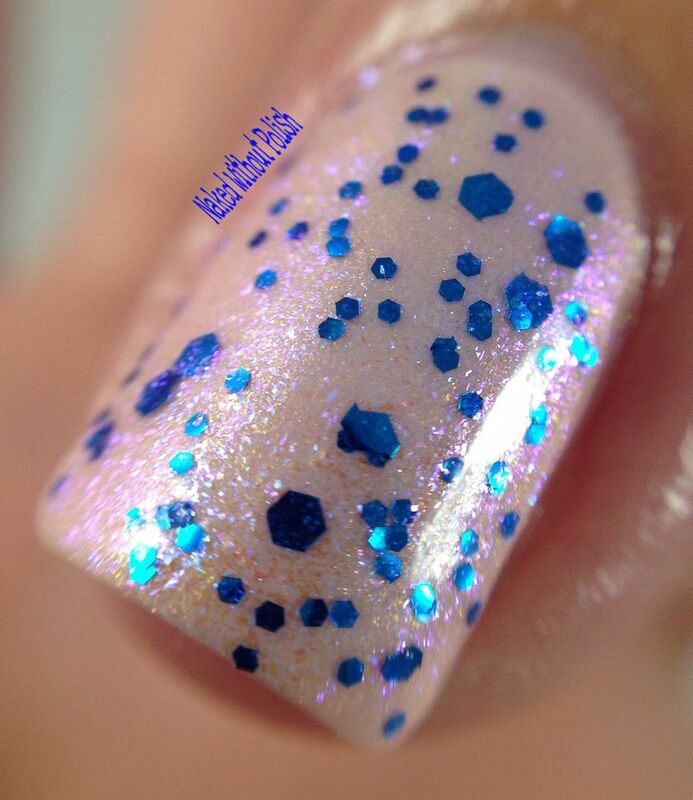 Shooting Star is described as "a metallic blue/purple glitter". 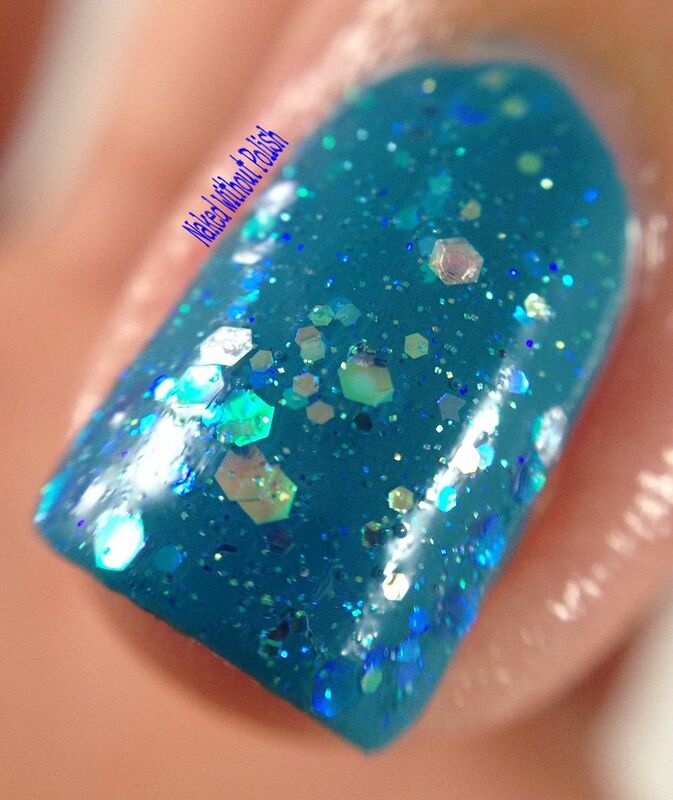 Shown is one coat of Shooting Star over Zoya Erika. Ok. I know my bottle says Golden Halo, so it seems they mixed up my stickers. 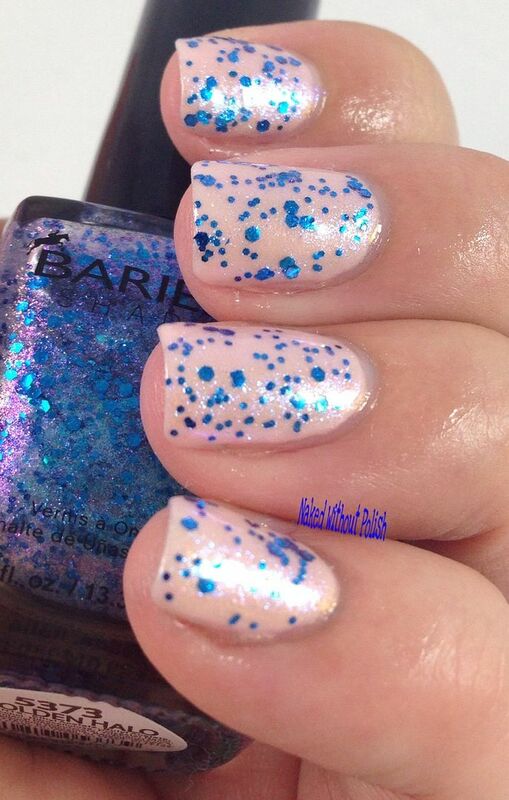 This is actually Shooting Star, a pink/purple/blue iridescent shimmer base with royal blue metallic hexes in multiple sizes. My favorite of the five, I didn't have as many issues with the formula with this one and it's just stunning. 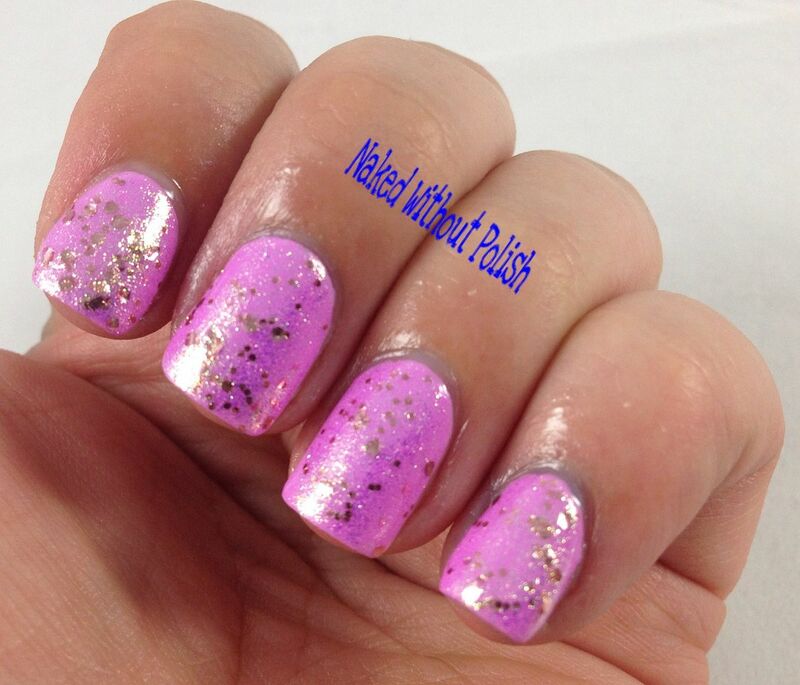 Golden Halo is described as "a gold with pink glitter". 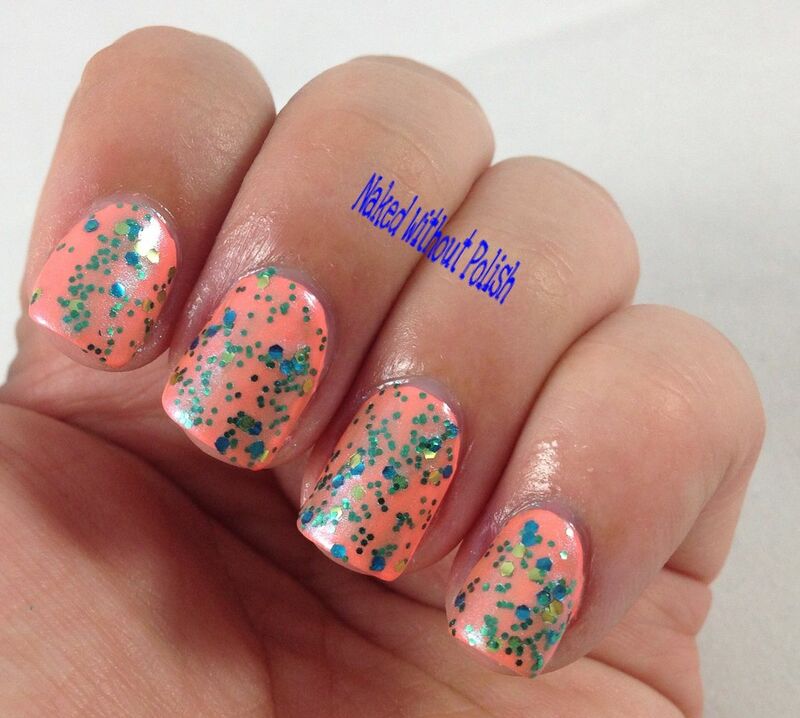 Shown is one coat of Golden Halo over Fresh Paint Passion Fruit. 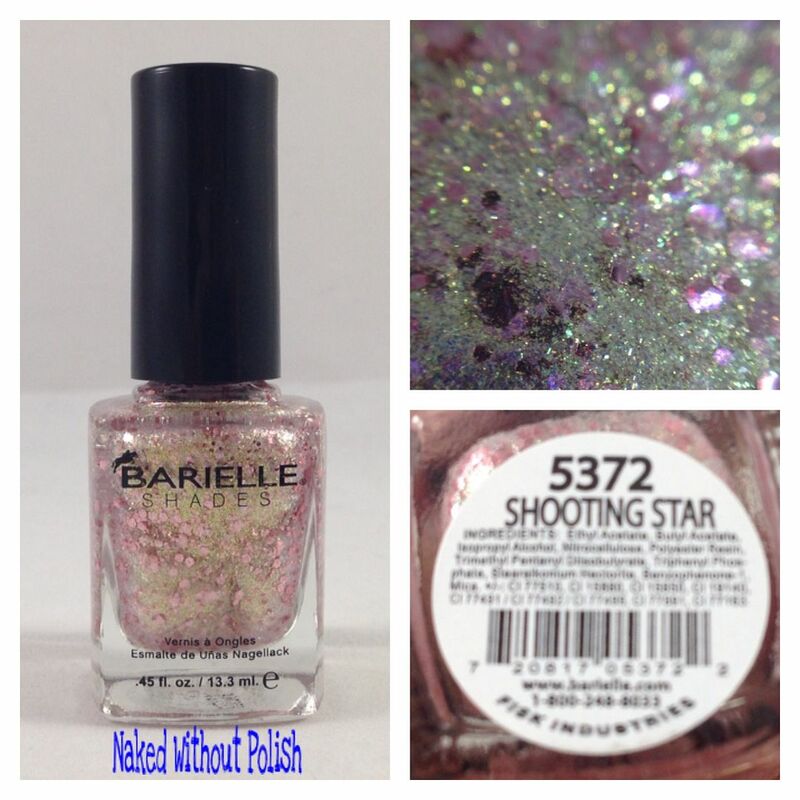 Yes, I know it says Shooting Star, the stickers were swapped. 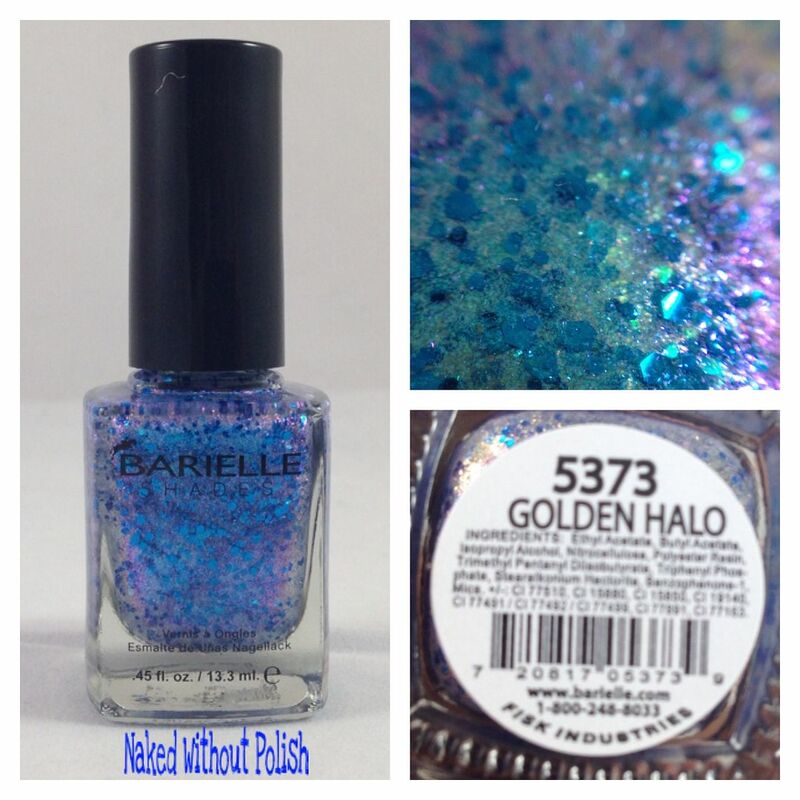 Golden Halo is another favorite from this collection. It's so simple...golden flakes and metallic pink hexes in multiple sizes...yet it has the power to transform anything you put it over. 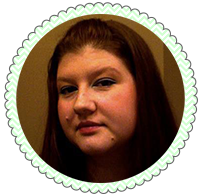 A little thinner needed to be added, but not a huge deal. 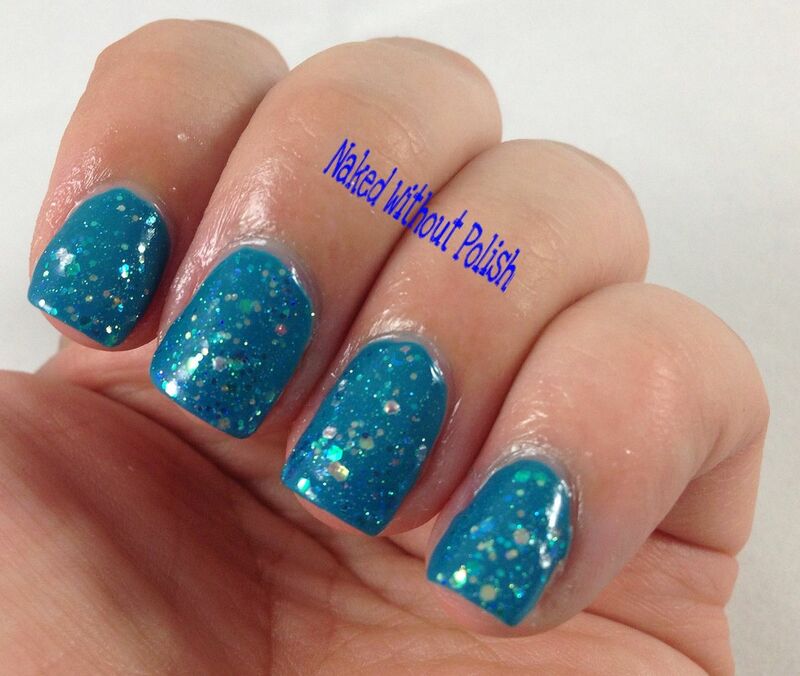 Angel Dust is described as "a sheer iridescent glitter". 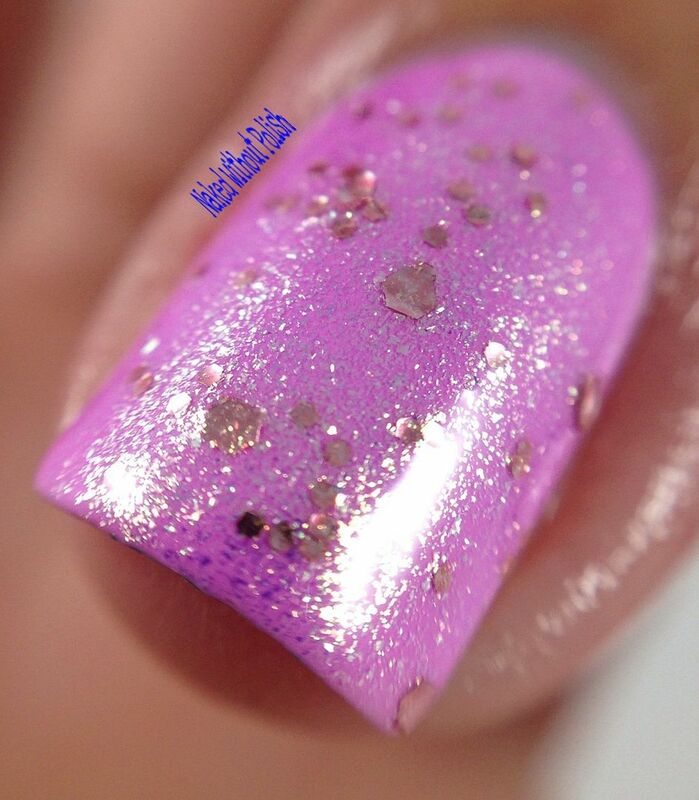 Shown is one coat of Angel Dust over Cult Nails Party Time. 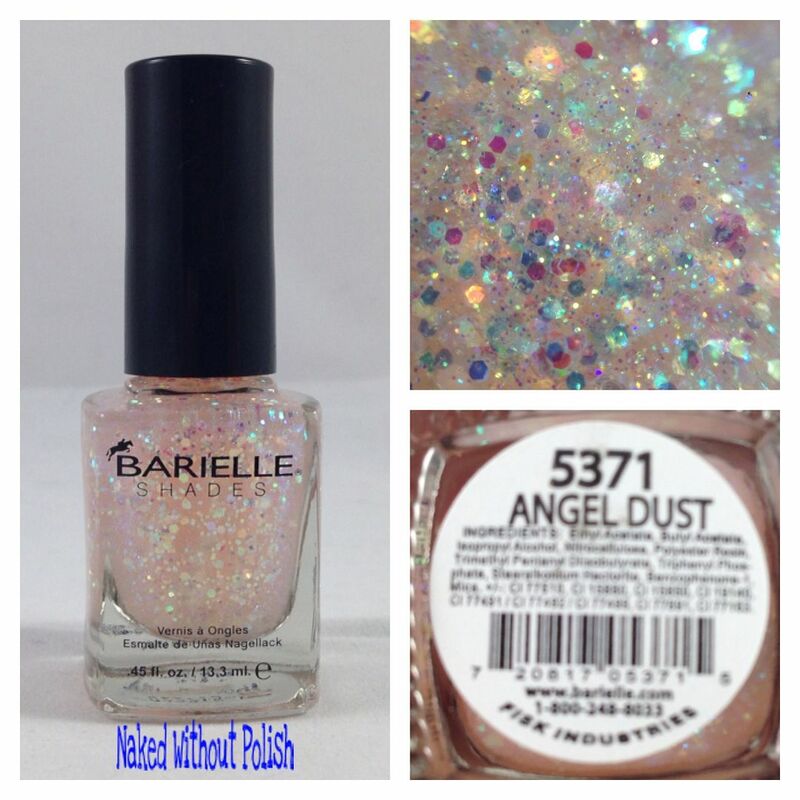 A clear jelly base filled with iridescent hexes in every size, Angel Dust is the most versatile of the five. It is another one that needed thinner, but no biggie. A little thinner goes a long way. In the end, you'll be more than happy. Bling it On Collection may have a couple bumps, but after a little thinner these beauties were like new. It could have easily been the weather here. It's been going back and forth between hot as hell and frigid. Driving me nuts!! 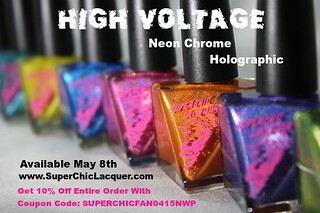 All five of these are available now for $8 each or grab the entire collection for only $25. 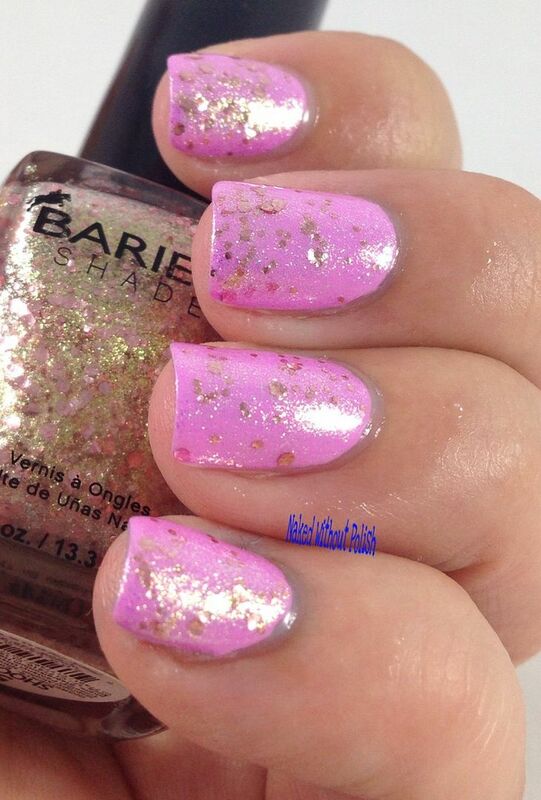 Barielle also released the Glitter Mania Collection at the same time. 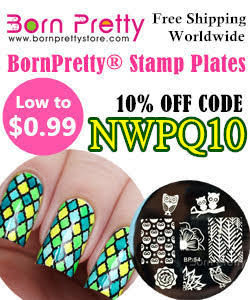 I don't have swatches of those, but they are worth checking out!